What does God really think of me? And why does He make me work so hard? We all have questions about God. He does some things we don’t understand. He does things we don’t like. He sometimes even does things that, quite honestly, annoy us. Why does He do what He does? Doesn’t He know that we need answers? If we could just figure Him out, life—as well as faith—would be so much easier. But life and faith aren’t easy, are they? Evil invades our world. Bad things happen all around us. People die every day for the mere lack of food and water. And in the midst of it all, we’re asked by God to believe in an absolutely unbelievable story. 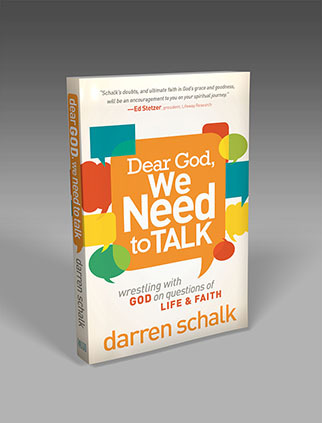 Dear God, We Need to Talk helps you explore your toughest questions about God. Tackling everything from family issues to God’s sovereignty Darren Schalk considers what he’s been taught, applies it to everyday events you can relate to, and then filters it all through a modern but biblical worldview in a delightfully witty and honest way. Leaving you, in the end, with more confidence in God’s power, His wisdom and His direction for your life.